Reaper is a full function audio suite I highly recommend for working with the various VST's and other plugin formats, particularly if you are 'stuck' using ASIO4ALL. You can load all the sounds from ARIA and Sample modeling into it allowing you to switch between them on the fly. It is capable of full recording, playback and sequencing of both digital audio and MIDI streams, is fully extensible with countless plugin effects, has a very robust editor and mixer, and is all around the best 'glue' for putting together a performance or recording I've found. It's also got a free evaluation, that is simply nagware; it does NOT disable itself when the time runs out, it just has a countdown timer on startup. For non-commercial use it's an entirely reasonable $60. I found it so useful I had no issues scrounging up that amount. What really makes it so useful to EWI USB players is that in addition to being able to handle all your MIDI and digital audio playback while using ASIO4ALL, if you have enough computer you can use the normal Windows WaveOut to handle playback -- something many claim is 'impossible' to have occur quickly enough for realtime audio. As you can see in the picture, setting it to four 512k buffers drops the latency to 46ms. Not as fast as ideal, but entirely acceptable for most situations. 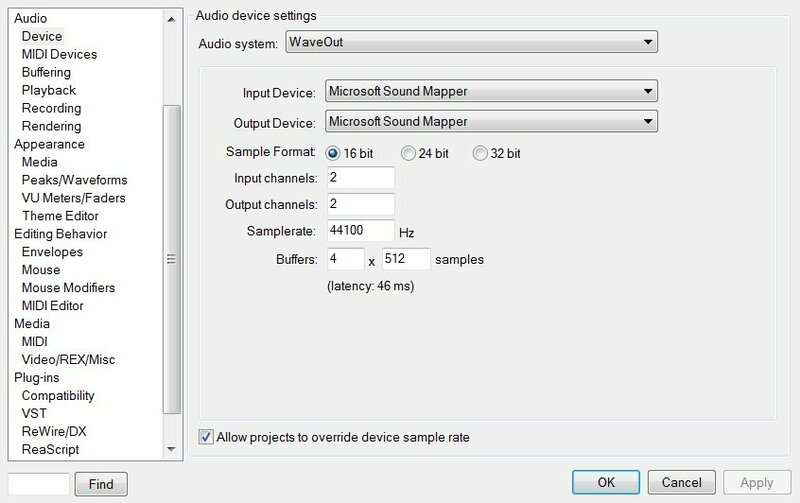 The wider support of audio device types combined with finer control over buffering and latency really makes it a winner for PC users for whom ASIO is nothing but a headache. It also helps that it's cross platform, with builds available for both Windows and OS X.
I highly recommend this software. The learning curve is a bit steep, but it's well worth the time put into it; easily compares to the much more expensive offerings from the likes of Cakewalk or Adobe.